I’m surprised by how many people that I interact with don’t know what the envelope budgeting system is. To me, it seems like such an easy way to create and keep a personal budget. My impression has been that everyone should understand this pretty easily. Impressions aren’t always correct. I’ve had to sit down more than once and carefully go over the concept only to be met with a puzzled look afterwards. In a large part that led me to write this post. I’ve also created a tutorial video as well. For anyone not familiar with this concept, the envelope budgeting system is a way to allocate your money towards expenses you’ll know you will be incurring. The simplest way to describe envelope budgeting is to imagine a pile of cash in your hands (your income) and several envelopes on your desk in front of you. Each of the envelopes is labeled with a budget category. Utilities, Groceries, Clothes and Car payment are just a few of the categories that you might use. As you get your income, you divide it out and put a predetermined amount into each envelope. When you reach a time where a particular expense needs to be paid, you take it from that envelope and pay it. Simple enough, right? Trying to explain the envelope budgeting system can be challenging, so I made a cheesy YouTube video that gives an overview on what envelope budgeting is. They say a picture is worth a thousand words so a video must be some multiple of that! Oh, and the music is pretty decent as well 🙂 I hope that by putting this on a video I can show anyone that doesn’t understand the envelope budgeting system how to use in their own personal budget efforts. The beauty of the envelope budgeting system is that you can budget for a variety of expenses. Monthly, quarterly or even yearly expense are easily accounted for with this system. Long term expenses can be especially challenging to budget for. The envelope budgeting system makes it simpler to periodically put funds away for these expenses. When they come due, you’ll have the money set aside to pay them. I find this budgeting system a great aid in setting aside funds for upcoming expenses. I also use it for savings and to pay off debt. Another advantage is that if you chose too, you can set up your own monthly level billing plan. In my mind this is a lot better than giving the utilities a free loan. It’s a simple enough system, and one that works. But perhaps it’s a little too simple since I really don’t know of anybody that uses paper envelopes to do this. What really matters is the concept of setting aside money towards a particular upcoming expense. The concept of the envelope budgeting system, I.E. the use of envelopes, is just that, a concept. It takes the basics of budgeting and lets you visualize, through the use of envelopes, how to set aside money for future expenses. That’s not to say that people do not use physical envelopes to sort and save money for future expenses, they do. But there are other ways, through the use of software to do this as well. I have a long history of using the envelope budgeting system. I’ve used this method of budgeting for more years than I care to admit. Initially I used accounting ledgers (paper, do you believe that!) to keep track of my checkbook. The multiple columns in the ledger were perfect to create envelope categories. I eventually graduated to spreadsheets which added a lot more flexibility as well as the capability to add an unlimited amount of categories, or “envelopes”. Eventually, I moved on to Quicken Deluxe to manage my checking. I use the “class” feature to create and track “envelopes”. I especially like this as I can pull individual reports for each of the “classes” to see what my spend rate has been. It also comes in useful when calculating how much I have to set aside each month for utilities. I simply look at the last years utilities expenses and divide it by twelve. I usually add a 10% buffer to that so I’ll have a little bit of wiggle room. The reporting feature makes this ideal for me. For those of you that would like access to your envelope budget online and on your mobile Android or apple devices, there are many options available to do this. I did a quick search and immediately found two that allow you to manage your envelope budget on-line, or on your mobile devices. Mvelopes and Eebacanhelp both offer an online envelope budget service that allows you to create and manage your budget from just about anywhere. I plan on doing a review on one or both of them in the future. If you’re interested in testing the waters by using a spreadsheet, you can also download a free excel spreadsheet from this mdmproofing. They’ve done a really great job with their envelope budgeting spreadsheet. The spreadsheet is setup so that you can use it as a check register. The key to this spreadsheet is that you can create as many or as little envelope categories as you need. Whenever you deposit, withdraw money or write a check, you allocate the transaction amongst the classes. The spreadsheet does all the math for you and let’s you see, at a glance, how much money you have in each envelope class. It’s as simple as you can make a spreadsheet. As an added bonus, it’s free! I hope this post has been informative and helpful. I’ve been wanting to write this for a while now but got hung up on my envelope budgeting video! It wasn’t that complex to produce but took a lot of hours in getting all the objects and timings right. Searching for the right music took some time as well. Do you use envelope budgeting to meet your financial goals? What tools are you using? If not, can you share your budgeting technique with us? I use to envelope budget a couple years ago, but now that we are debt free we focus primarily on cash flow. It was a great system and worked wonders for when we were paying off our debt. I’m such a stickler for knowing everything in my check book that even when I get out of debt, I’ll probably still keep it using it. 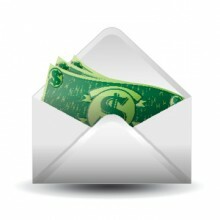 The envelope system is a great way to budget your cash. I’ve tried it and it works, but for some reason we have a hard time sticking with it. We’re going for it again in April though. Love the video BTW. I’ve been sticking with it for a looong time. One thing I don’t do is try to track every single dime with an envelope. (you noticed in the video John kept $60 of pocket money). You have to give yourself a little slack. If you don’t , you’ll dip into one of the envelopes for something you shouldn’t. Yeah, having a little “blow” money is really important. It really helps prevent the feelings of depriving yourself. It is important. There has to be a little fluff somewhere to soak up things you haven’t planned for. Personally I think that anyone that tries to budget every single dime is on a path to failing. I know of it, but never tried it because I just didn’t want to. I use the whiteboard method that allows me to put my expenses to be seen easily and I can update anytime. This works for me. I’d be interested in hearing more about the whiteboard method and how you use it. I have a pretty good idea of how I would use a whiteboard to budget but am curious to know if there is a generally accepted budgeting style or is ut up to the individual users. I’ll be googling that in the next few minutes. Great post and loved the use of video too. I have tried the literal envelope method with cash in my room. Your way is certainly more effective! I do like the idea of having money budgeted out this way though and I continue to use the envelope method, sans envelopes of hidden cash. Thanks for stopping by Erin! The envelope method works for me, I have a hard time even trying to wrap my head around other methods. Although, I’m going to look into the whiteboard method that Grayson mentioned. Gotta love that music, Jose. :-). Seriously, though, you are right on track here. This is a simple and effective way to budget and to stay on track with your budget: when the envelope is empty in a certain area, you’re done! Thanks for a great post! Thanks and Your Welcome Laurie! I’ve wanted to do something on envelope budgeting for a while, I think it’s important that folks at least take a look at it and understand it. Getting the video done took some time (mostly learning curve issues). I am picky about the music though, luckily there’s a lot of license free music available for stuff like this. Some of it’s actually pretty decent! We have been using the envelope system for far much longer than I care to admit. 🙂 Even though we’re debt free, other than our mortgage, we still like using it as it allows us to keep our expenses straight. We do use several bank accounts for the bigger items, but use plain ol’ cash for much of the rest. We don’t use cash so this system would not work for us. I did once ask my FB fans if they used it and what they thought and most didn’t prefer it. They also didn’t prefer using the jar method either. The reason with the envelope system was 1. they didn’t use cash 2. it was a pain taking cash out, and putting it in envelopes, 3- they had a tough time sticking to it they would just use money from other envelopes if they needed money. Like any form of budgeting system if someone wants to really budget they will make it happen. This is a simple system and one that has and will work if someone wants to take control of their personal finances. Cool video! Simple and very important; great post, Jose! Thanks Tony, I appreciate you stopping by! My wife and I don’t really focus on envelope budgeting for now. We tend to look more at managing cash flow. Although, after watching that sweet vid it might be worth another try! Awesome work on the video! My wife told me we should try a video post, but I don’t know where to begin! Thanks Jacob! I used Videoscribe (Available for the Mac and Android platforms) and Microsoft movie maker to do the video, There was a steep learning curve at first but once I got the hang of it it got a lot better. I was hoping to help with the site promotion by doing the video. It takes a lot of time to get it right, it’s still not 100% to my liking but I had to draw the line somewhere. I will probably do a few more, it’s fun but time intensive! Never heard of envelope budgeting, but I think its a great idea, and I love the video Jose! Great work on this post! Thanks Jim! The video was both a challenge and fun to do! I plan on doing a few more in the future. I like to do envelope budgeting and have been doing it for 10 years. however, not many folks have the discipline to do something like that. there is no reason to do so for them. I agree with you on the discipline aspect of budgeting. I think the biggest problem as it related to Personal Finance and debt is rooted in discipline to start with. It’s a lack of discipline that can create financial problems to start with.